It was six-thirty at night and Elizabeth Adams was still at her desk. The newsroom was comparatively quiet--the usual cacophony of clattering typewriter keys absent for the time being. It was a short walk to the Colony at Madison and Sixty-first Street. Gloria chattered about a range of subjects from the DeWitts' horse's chances at Aqueduct that weekend to her opinion of the latest spring gowns from Paris beginning to appear in the shops. This one is definitely for me. Adding it to my list right now! Ooh, I love the era and the sound of this book. Thanks for sharing...and for visiting my blog. I love the 20s/30s period and this cover really fits the theme! Hope you enjoy. This sounds so good!! Adding it to my list now!! This sounds really good. And such a great cover too. This sounds great. I'm adding it to my wishlist. Sounds good. The cover reminds me of Rhys Bowen's books. Happy weekend! That sounds cool. Thanks for visiting my blog earlier, Kathy! Happy Reading. Hope it's a fun mystery for you. Well this looks super fun. Hope you enjoy! Loved your Goodreads review of this one Kathy and like yourself, I would quite like to see it become the start of a series. I will be the first to admit that the majority of Peg's books are probably a bit too 'cozy' for my liking. 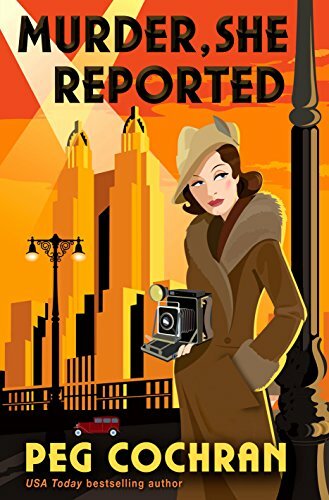 However if she manages to keep 'Murder, She Reported' running more along the lines of a classical 'whodunnit', as regards the narrative and dialogue, then there is real potential and would certainly get my vote! I could so imagine all this in a film noir... I started reading the beginning and it appeared in my head just like that! Awesome! Sounds like a fun book! Love the cover! Thanks for always participating in Book Beginnings on Friday.